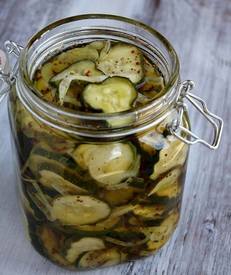 These Bread & Butter pickles from Recipe Girl are so simple to make. Be careful... you'll want to eat the whole jar! This is truly a wonderful, no-canning skills needed recipe for Bread and Butter Pickles. Although sweet pickles are my favorite, bread and butter pickles run a close second. Their sweet and tangy crunch are pretty irresistible.